Tonight Kuroko no Basket Season 2 Episode 3 aired! Crunchyroll lists it as Episode 28 instead, so you can look for that when you want to watch it. The Episode is titled "START!" and just from the name we know that it is the beginning of what everyone has been waiting for - The Winter Cup. Well not really the winter cup but it is the beginning of the preliminary matches which will result in 2 teams entering the Winter Cups. The Episode is all about Kiyoshi Teppei , we get to know his way of playing basketball and a little about his past. We are told that (Minor Spoiler), he belonged to the team who were feared almost as much as The Generation of Miracles back in their time of youth. Kiyoshi's skills are put to test when Seirin plays against a team in the preliminary match. Though that team is entirely useless against Kiyoshi. Not only does Seirin win the match but completely destroys them with a good difference in the number of baskets, most baskets scored by Kiyoshi and Hyuga. The episode ends with a basket score by Kagami, who did not do anything in the game until now or more like he need not do anything in the game since Kiyoshi had everything under control. At last, we see a message of some type saying how Kagami has reached the level of the members of The Generation of Miracles. This message appears after we see the last basket by Kagami with the help of his inhuman high jump. The Generation of Miracles is now kind aware of the fact that someone has caught upto them. At this point we see a screen with the faces of all the members (As shown below) while still hiding the face of Akashi since he has yet to make a proper appearance in the Anime. Overall the episode was focused on Kiyoshi only but it has also noted the start of the most awaited, Winter Cup. 8 teams entered the Preliminaries and after today's episode if we don't see the remaining matches then only 4 teams will remain one of which is Seirin. The next match will be between those 4 teams and the 2 winning teams will enter the Winter Cup thus we are only 1 more match away between Seirin and one of the other 3 winning teams, after that we will all the great teams show their skills in the Winter Cup itself! Did the episode live up to expectations? Was all the hype for the episode before it was aired worth it? 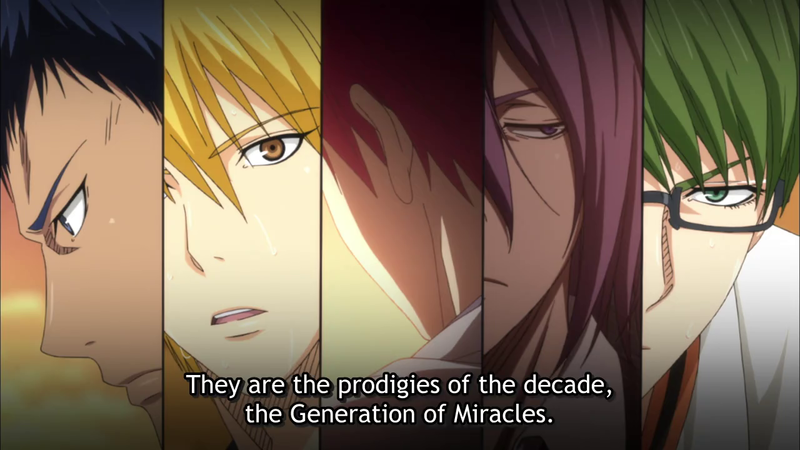 The episode marked an start of Winter Cup and showed us a lot of information on Kiyoshi but not only that, it also somewhat declared that Kagami has reached upto the Generation of Miracles at this point and so for all these reasons there is no way to say that the episode was bad, it gets a 9/10 from me only because I was not happy about the music used in the 2nd half of the episode. Season 1 had amazing music, compared to that the 2nd season is lacking bits of that awesomeness but guess it is only a preference and some might love the music in 2nd season over the first one! So go ahead, watch it on Crunchyroll, own it on dvd when it comes out and your money will all feel worth it!